"Using an Nvidia GeForce RTX 2080 Ti, it’s possible to run the game at nearly 60 frames per second at a resolution of 2,560 x 1,440." This doesn't seem like something you'd want to proudly display on your new $1,200 graphics card's award section. Can't even play a 21 year old game at 60 FPS. FPSChris, Eldritch, veLa and 5 others like this. Was thinking the same thing. It doesn't even look that good and takes away the nostalgia. veLa, JaredTheDragon, pencea and 1 other person like this. You guys obviously do not understand how visually complex and demanding this technology is, or have an educated history of what happens to GPU's when they push new tech. Drew Valadez, Kibaruk and QuantumPhysics like this. Yes we know, every other AMD generations there's new tech, maybe that's why they kept losing, just like this "RTX" is crappy now. But hey can't we just please enjoy this time giving **** to the Green team? save your excuses please. just like this "RTX" is crappy now..
All new technologies for graphic enhancement go through this phase, its not crappy, its in its infancy. But hey can't we just please enjoy this time giving **** to the Green team? Go ahead, I've been as upset as anyone over their RTX pricing. I bought my RTX2080Ti just to have it and then wait for developers to deliver content for it. Ray Tracing is basically a graphic candy, but it's extremely demanding tech that is still not matured. 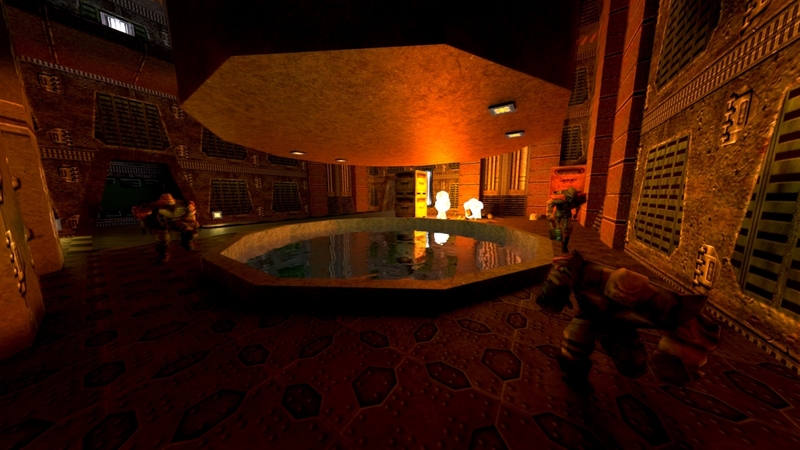 Quake 2 swallowed many hours of my life in multiplayer and singleplayer. It looks better than ever. When Quake 2 was released, G.R. knocked it saying that "all it added was colored lighting" and insulted the AI for just ducking or sidestepping projectiles. Visually complex and demanding doesn't suddenly make it good. The reason modern graphics look as good as they do is because many current technologies are shortcuts to the way light actually behaves in real life. You can brute force a small improvement in visual fidelity or you can be smart about it. Nvidia did the former. My first boss always told me to work smarter, not harder. Nor is it traditional to nearly double the price of the top end graphics card for a single small graphical improvement that was used in 0 games at launch. ShObiT, Burty117, JaredTheDragon and 1 other person like this. While I see your point, I would rather wait until the tech is used, then buy the card for much cheaper. Often times it is the next generation before it's adopted into (playable) games. I predict the 3080 or whatever will probably double the frames as it will be built around RT optimization. Just my thoughts though. Impressive, if this is created by a single guy. While I see your point, I would rather wait until the tech is used, then buy the card for much cheaper. But this doesn't alter or address my point. It's not that visually complex or demanding at all. We've been using it for over 20 years in the CGI realm. I use it ever day for a living in arch/viz, and we've had no problem rendering with the GPU for MANY years with Redshift, Octane, Vray RT, iRay, and other engines. GPU-tech is simply pushing the data through the other pipeline; instead of the CPU and a few cores it's going to the GPU and many hundreds of cores. You're not coming off as educated or "edgy" by pretending you know more about it than anyone else here. INB4 "muh realtime engines are different". And every reader here has an "educated history of what happens to GPUs (there's no apostrophe there, kiddo) when they push new tech" because that's what these articles are about, and we've all read them. The RTX sales-pitch is terrible and Nvidia overshot their mark on this one. They aren't powerful enough to push the tech they're sold to push, by a longshot. roberthi, ShObiT and 144hzGamer like this. Looks really good actually, I wonder what the original Half-Life would look like fully Ray-Traced? I wonder if Beth will re-re-re-re release Skyrim, this time in full RT glory to play with the new lineup of RT gpus, the 3080s. (my fingers were itching to add apostrophes to every single instance of a plural form). People will use any excuse for Nvidia. It's not that visually complex or demanding at all. We've been using it for over 20 years in the CGI realm.. I've had to address this before, looks like I have to address it again...to me this is common sense but some people require an explanation. Running RT in real-time with millions of possible outcomes/reflections/events versus a scripted event in a movie or CGI is much different, its not even close to being the same thing. Your talking about the worlds fastest gaming GPU being brought to its knees on a game that can be run on a Pentium II 400MHz and 16MB Voodoo Banshee. Your talking about the worlds fastest gaming GPU being brought to its knees on a game that can be run on a Pentium II 400MHz and 16MB Voodoo Banshee. And that is exactly why it is not brag worthy. ShObiT, JaredTheDragon and Eldritch like this. Thats exactly why it is. People don't care about the backend as long as the frontend is not impressive. We can argue how many billions of computations of physiscs, vertices and shading happens to render a frame but nobody will be impressed as long as output itself isn't great. RT is future, no doubt about that. But it isn't mature yet and may not be for atleast two more generations. I think people may be underestimating the tech. Give it time, it's not going anywhere. If it is in its infancy then we should treat it as such. Call us back when it is relevant, until then it's just you making excuses. Evernessince, ShObiT and JaredTheDragon like this.